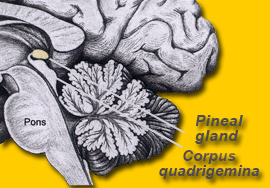 ::: Brain Maps ::: Pineal Gland, Epiphysis cerebri, Glandula pinealis. 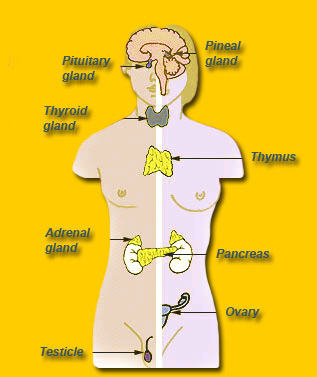 Right: Endocrine system of man and woman. External Link Disclaimer: We as the creators of Brain-Maps.com are not responsible for the contents or reliability of any linked websites and do not necessarily endorse the views expressed within them. The listing of a link shall not be taken as endorsement of any kind. We cannot guarantee that these links will work all of the time and we have no control over the availability of linked pages. Please note: While we as the creators of Brain-Maps.com make every effort to post the most accurate and reliable information, we do not guarantee or warrant that the information on this web site is complete, accurate or up-to-date. We assume no responsibility for the use or application of any posted material. This web site is intended solely for the purpose of electronically providing both the public and scientists with brain-related information and convenient access to the data resources. We assume no responsibility for any error, omissions or other discrepancies between the electronic and printed versions of documents.